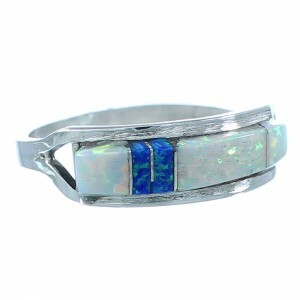 Sterling silver, along with man made Blue Opal and White Opal. 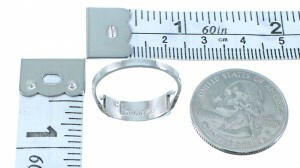 Ring is size 5-3/4, it measures approximately 1/8" long and 5/8" wide. This is a very exquisite ring that must not be overlooked! This piece of Native American jewelry is Zuni hand crafted by artist C.S. Lonjose out of genuine sterling silver and man made multicolor inlay. 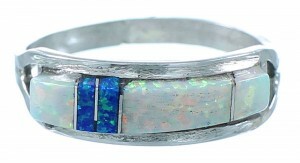 The inlay consists of: Blue Opal and White Opal. The inlay is delicately set, while creating a magnificent design for a perfect look. 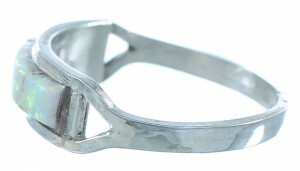 Ring is hallmarked by the artist.